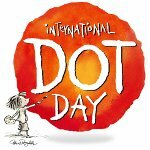 International Dot Day is a global celebration of creativity in the classroom held on September 15 or around this date. It was inspired by The Dot, a 2003 picture book written and illustrated by Peter H. Reynolds. The Dot tells the story of a girl named Vashti who says she can’t draw. In response, her teacher tells her “to make a mark and see where it takes her”. Vashti draws a dot and signs it, and her teacher frames the picture and hangs it in her office. Vashti sees the picture and thinks that she can draw a better dot. She then starts to draw colorful, more elaborate dots and realizes that she can draw after all. The Dot has been translated in more than twenty languages and has won a number of awards. It has also been adapted into a film that received the 2005 Carnegie Medal for Excellence in Children’s Video. International Dot Day was created to promote authentic learning, creativity and self-expression in the classroom. It began when teacher Terry Shay introduced his students to The Dot on September 15, 2009. On or around September 15, thousands of educators and students around the world celebrate all that creativity inspires and invites. The celebration includes activities aimed to encourage students to use their talents, gifts and energy to make the world a better place.